Last night the English teachers from my school went out for a night of food and bowling. We ate at a shabu-shabu restaurant. 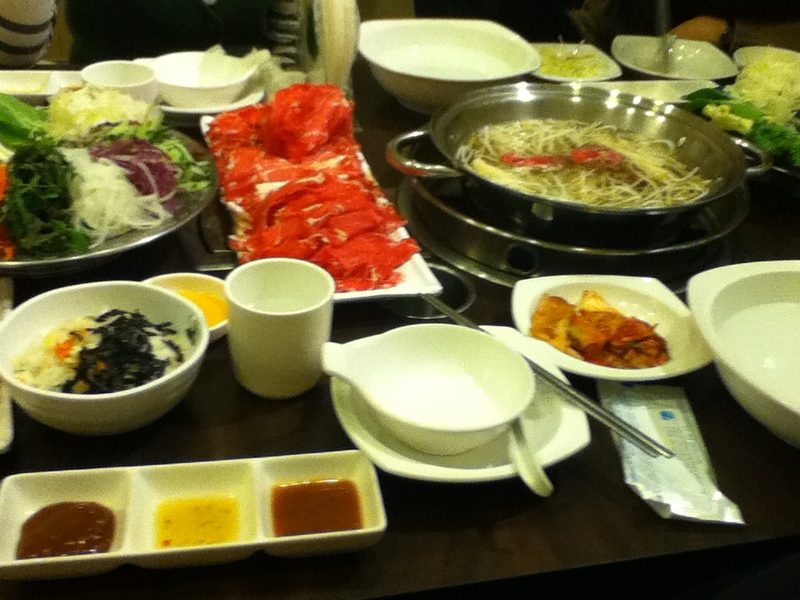 This was, by far, the best food I’ve had in Korea. If any of you come visit, we must go eat at this place. 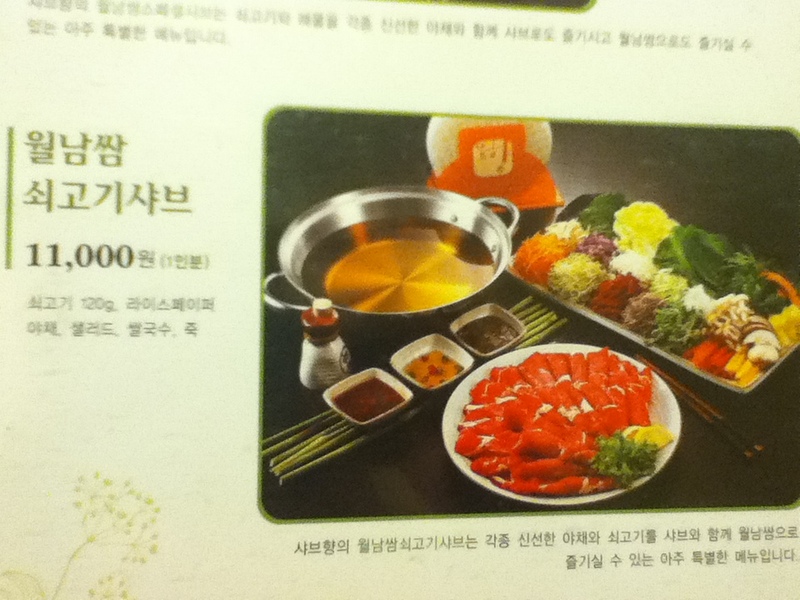 They bring out a pot of seasoned broth and you boil the broth then cook very thinly sliced beef in it. You are also brought loads of veggies and rice paper. 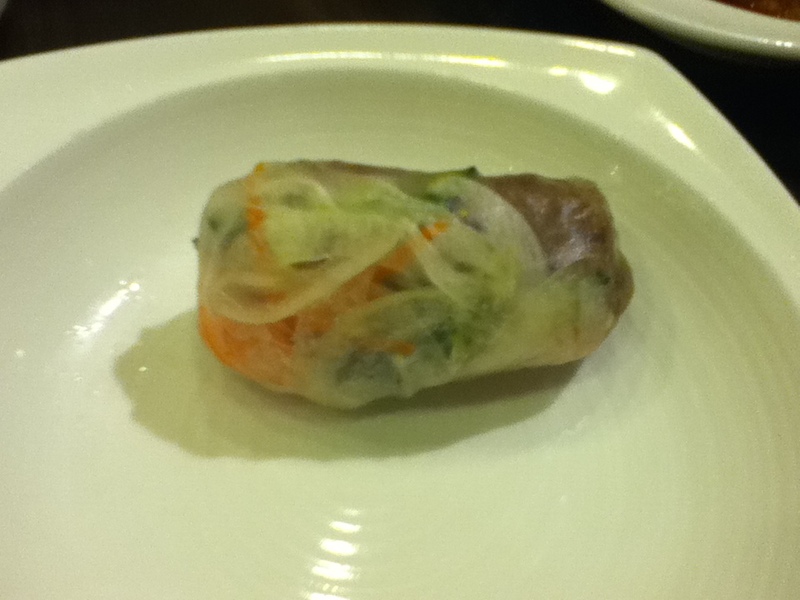 You wet the rice paper then fill it with veggies, meat and sauce and then wrap it. It’s so good! The girls said that it’s like Korean/Vietnamese fusion. After dinner, we walked to the bowling alley, which is located about a subway stop away inside of Home Plus. Bowling was such a blast. There was tons of high fiving going on, even for gutter balls. The ladies I work with are super sweet. I was in second place the whole game, but I had a comeback on the last two frames and won. Something I thought was really neat about the bowling alley was the way you rent shoes. 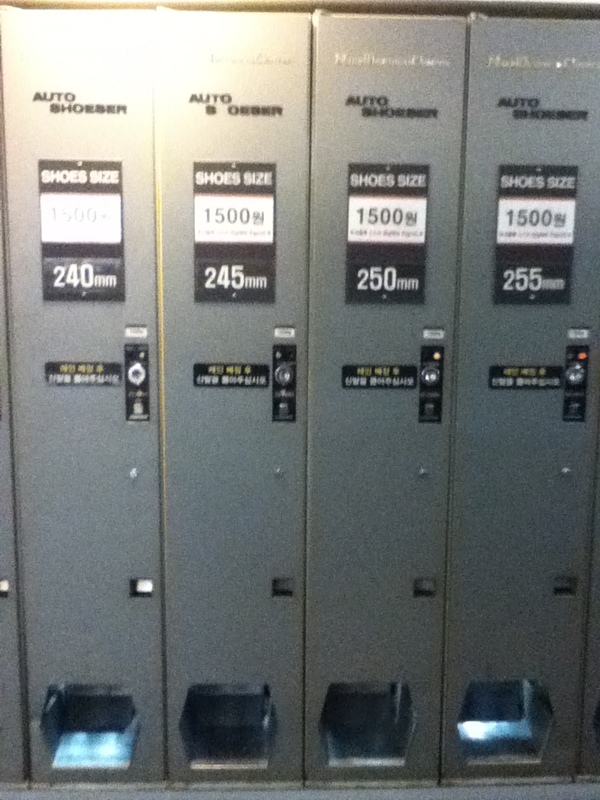 The shoes are actually distributed through venting machines. The fee is 1,500 won (about $1.40). You insert your coins into the machine with your shoe size and the shoes drop out of the bottom. So cool. After the game we walked around Home Plus to buy some snacks and supplies for the English teachers’ office. My two co-teachers shared a taxi back and JuHye and I took the subway. I only live two stops from where we were and I wanted to find out where the subway station was so I could come back on my own sometime. I look forward to many more teachers nights in the future. This entry was posted in Teaching English in Korea and tagged 2011, bowling, Busan, co-teacher, EPIK, ESL, Home Plus, Korea, Korvia, shabu, shoes, spring, TEFL by Meagan & Dave | HappilyEverExpat.com. Bookmark the permalink.